Okpaku et al. (1997), USA RCT Case management + vocational specialist (provided for first 4 months) (N=73) Services-as-usual (N=79) All participants were applying for or receiving SSI/SSDI. NOTES: Results based on subsamples of those who worked competitively are likely biased upwards. Unless otherwise indicated, Bond et al. (2008) and Twamley et al. (2003) did not report statistical significance. Bolded studies indicate that the study reported statistically significant intervention-comparison differences for one or more outcomes. Information on country, study design, and results are as reported by Bond et al. (2008) and/or Twamley et al. (2003). Sample sizes and notable characteristics not reported in Bond et al. (2008) and Twamley et al. (2003) were extracted from the original articles. Bond et al. (2003) reported that the treatment-control difference was significant but did not report the level of significance (p-value). Gold et al. (2006) identifies the intervention as IPS with ACT. N/A=not applicable; e.s.=effect size, n.s.=difference is not significant; T=treatment (group); C=control (group). NOTES: Unless otherwise indicated, statistical significance was not reported. Results based on subsamples of those who worked competitively are likely biased upwards. Underlined studies indicate that the study reported statistically significant intervention-comparison differences for one or more outcomes. Twamley et al. (2003) and Bond et al. (2008) reviewed 3 of the same studies, and all 4 studies reviewed in Campbell et al. (2009) are reported in Bond et al. (2008). Because of this overlap, pooled results should be considered a general picture of evidence and not thought of as wholly distinct findings. The 4 RCTs are: Drake et al. (1996), Drake et al. (1999), Mueser et al. (2004), and Bond et al. (2007b). P-values are reported in Cook et al. (2005). N/A=not applicable; e.s.=effect size; T=treatment (group); C=control (group). SR Interventions to maximize reintegration of workers with mental disorders into the workforce 97 observational or experimental studies 32 of 97 studies concerned reintegration; 10 of them were conducted in populations of veterans Limited knowledge exists about how to reintegrate people with mental disorders into a new workplace after an absence of more than a year. Knowledge specific to veterans is even more limited. RCT IPS model described in A Working Life for People With Severe Mental Illness (N=42) Standard VR Program (N=43) Veterans at the Tuscaloosa VA Medical Center ages 19-60 with a diagnosis of PTSD, a medical clearance to work, and who are currently unemployed and interested in competitive employment The study group was 2.7 times more likely to gain competitive employment. Other employment outcomes, including time worked and total earnings, also favored the study group. These findings were statistically significant and are consistent with previously reported advantages of IPS over traditional VR programs. RCT SSDI beneficiaries with no health insurance received health insurance, medical care management, employment and benefits counseling and PGAP for new SSDI recipients; N=611; 22% had mental disorders, including individuals with psychiatric disabilities AB group received only health benefits package (N=400) and new SSDI recipients with no intervention (N=986) Newly entitled SSDI beneficiaries who were approved at their initial medical determination ages 18-54 with at least 18 months before the start of their entitlement to Medicare and who resided in 1 of the 53 metropolitan areas included in the demonstration The AB Plus group participated in vocational services at a greater rate during all 3 years of follow-up, and was employed at a greater rate and earned more on average during the second year after random assignment. These results disappeared at the third year follow-up. Results were statistically significant. QED Housing assistance, employment case management, case coordination by an employment specialist, work supports such as training and uniforms, and linkages to workforce development centers provided at 1 of 3 LA County community mental health centers (N=56) Homeless individuals with SMI receiving non-program services at one of the other 15 LA County community mental health centers (N=415) All participants qualified for county mental health services, usually with a diagnosis of schizophrenia or affective disorder, and were homeless at enrollment. Propensity score matching was used to compare groups. The T group had an employment participation rate (57% vs. 22%) and competitive employment rate (27% vs. 13%) more than double that of the comparison group. T group participants were more likely to work FT rather than PT and less likely to have had no employment at all while in the program. Of those who did gain employment, the T group took fewer days to do so and worked more days in competitive employment after they did. Approximately half of the overall days worked by T group participants were in competitive employment. Some but not all of the observed employment outcomes may, in fact, be attributable to improved housing outcomes rather than to a specific employment intervention. QED Residential treatment longer than 30 days, including a variety of clinical and rehabilitation services available at 11 HWVP facilities (N=217) Identical residential treatment that lasted less than 30 days (N=234) Homeless female veterans who had been receiving VA health services for less than 6 weeks and had psychiatric and or addiction disorders The T group had significantly more days worked on average. Treatment was also associated with significantly improved clinical outcomes in a variety of non-employment domains. Because the services offered at the HWVPs varied, it is theorized that the provision of housing, rather than specific services, was the key factor in improving employment outcomes. Pre-post In-house SE services (N=60) n/a Clients with SMI at a supportive housing agency in New Jersey, including individuals with long histories of hospitalizations The competitive employment rate doubled to 26% after 12 months and remained above 50% after 24 months. Another 18% had returned to school or participated in job training at the end of 3 years. Descriptive Career mapping, which identifies strengths, gifts, and capacities of participants to reveal concrete strategies for addressing barriers to employment (N=45) n/a Homeless clients with disabilities, not all of whom had psychiatric disabilities, who want to work Of 45 participants, over 18 months, 25 obtained jobs consistent with their person-centered plan. Consistent with their "zero reject" approach, these were all chronically homeless individuals, defined as being homeless continuously for more than a year or for having experienced at least 4 episodes of homelessness in the past 3 years, and having a disabling condition. Descriptive Blend of SE and ACT (N=791) n/a Homeless individuals in Vancouver, Washington, identified in shelters and at transitional housing sites with a "zero reject" approach The goal for the 5-year program was to engage 250 clients, develop 175 personal career plans or vocational profiles, and help 75 participants secure employment. After 39 months, 791 clients had been engaged, 543 vocational profiles developed, and 129 participants had secured employment. Pre-post/ implementation study IPS (N=321) Services received prior to implementation of IPS (N=308) Homeless veterans who were not receiving VA health services, expressed interest in seeking competitive employment, and were diagnosed as having a psychiatric or substance abuse problem Controlling for baseline differences, the post-implementation group engaged in an average of 15% more days of competitive employment over the 2-year follow-up period. The study's authors conclude that a low-intensity training approach can successfully implement an IPS program in a system previously unfamiliar with the approach and show improved employment outcomes. Descriptive SE (N=37) Individuals with severe and persistent mental illness who received SE services but had no forensic involvement (N=1,236) No significant background differences between those with recent forensic involvement and those without. Those with forensic involvement were more likely to have worked in the previous 5 years, less likely to have a diagnosis of schizophrenia, and to have had significantly higher levels of positive and general symptoms. In this unpublished and exploratory analysis, forensic involvement was a non-significant indicator for all employment outcomes for individuals with severe and persistent mental illness receiving SE services in the EIDP. The implication is that SE may be an effective employment intervention for the forensically involved because that population enjoyed the same employment gains in the EIDP as those without forensic involvement. NOTE: Underlined studies indicate that the study reported statistically significant intervention-comparison differences for one or more outcomes. SR This review sought to identify implications from qualitative studies investigating the employment-related views of people with persistent mental ill health to guide further development of employment supports for them. 20 studies were included for qualitative metasynthesis. Included studies were conducted in the USA, Canada, Australia, England, and New Zealand. Participants were employed in wide-ranging jobs. Support within the workplace can affect job satisfaction, job retention, job stress, decisions regarding disclosure of psychiatric disabilities, and decisions to leave jobs. The authors found that employment has varied meanings, benefits, and drawbacks; strategies for maintaining employment and mental health are important and require ongoing active self-management; supports in and out of the workplace are helpful; and employment barriers are partially systematic. SR The review examined interventions or programs that could be implemented in workplaces to improve workers' depression and reduce associated productivity losses. 14 articles on 12 studies were included; 10 of the 12 were RCTs and 2 were non-randomized studies. 4 studies were conducted in The Netherlands, 4 in the USA, and 1 each in Canada, Finland, Denmark, and Japan. Interventions were psychological (2 studies), enhanced primary care (4), psychiatry plus occupational therapy (1), enhanced occupational physician roles (2), integrated care management (2), exercise (1), and worksite intervention (1). Evidence from all included studies were considered "very low" quality because: (1) all included studies were judged to be at a high risk of bias; (2) evidence for specific interventions was always based on data from 1 study; (3) the population included in the studies was often not considered generalizable to the population of interest for this review; and (4) there was imprecise data for all primary outcomes because in all instances only 1 study provided evidence. The authors concluded they cannot recommend any 1 intervention, and instead recommend future research. The review also found intervention savings to employers ranged from $503 to $5,136 per worker. Savings to society ranged from an incremental cost-effectiveness ratio of -736 Euros to an incremental cost per QALY above usual care of $36,467. SR The review examined work-directed and worker-directed interventions for reducing work disability of depressed workers. 11 RCTs No work-directed interventions were included. Interventions were pharmacological (4), psychological (2), and combinations of the two (5). The authors could not find any high quality studies of employer-level interventions. The review found limited evidence that clinical intervention can reduce sickness absence from work in depressed people. The authors conclude that depressed employees require work supports and accommodations in addition to clinic treatment in order to improve employment outcomes. NSR The review examined employment interventions for individuals who experience mental illness. The author developed a framework of individual-level intervention categories. Employer-level interventions include routine screenings, education/awareness campaigns, and developing organizational frameworks conducive to good mental health. The author did not find high-level evidence for employer-level interventions. There was more support for individual-level interventions, including clinical treatment, social network development, and reasonable job accommodations. NSR The review examined interventions to promote keeping people with affective disorders working or to help them return to work. The study reviewed interventions for people in 5 categories: mental health, people with an existing workplace, people without a workplace, employer-level interventions, and people with other than mental health problems. Interventions included clinical treatment, case managers providing employees with appropriate supports, supervisor support, social support, and education and training. The authors found a wealth of studies reporting on interventions to assist employees with affective disorders, but few that report employment outcomes. The research is even weaker for employer-level interventions. The authors conclude there is a large gap in the research evidence on this topic. RCT The study examined Texas' DMIE program. "wrap-around" health services (N=888). Regular health care through Texas' Harris County Hospital District (N=697) Participants were low-income, working adults; predominately female (77%), middle-aged (mean age 47), and minority (40% African American, 30% Hispanic); 11% diagnosed with SMI. Intervention participants were twice as likely to make any mental health visit (12% vs. 6%, significant at 0.01), and less likely to receive SSI/SSDI (6% vs. 8%). Intervention participants displayed no significant difference in employment, earnings outcomes, or mean SF-12 MCS scores. RCT The study examined Minnesota's DMIE program: a comprehensive set of health, behavioral health, and employment-support services, coordinated through a navigator (N=888). Usual care (N=267) Participants were working at least 40 hours/month, had mental illness diagnosis, and were not eligible for other state-sponsored public programs. The intervention group maintained or improved ADL functioning compared to the C group. There was no significant difference in employment outcomes between groups, although lower-functioning participants from the C group displayed lower earnings than lower-functioning T group members. Participants in the intervention who were more engaged with the program displayed significant improvements in mental health status. RCT The DMIE program, interventions providing medical benefits and financial assistance for health care, although the specific packages of services varied in each of four states (N=2,125). Only Minnesota and Texas intentionally focused on people with mental health. Usual care, although control conditions vary by state (N=1,299) Sample characteristics varied by state. Participants in all states were primarily female. Minnesota, which focused specifically on individuals with mental health issues, had the lowest mean mental SF-12 score (35.0). The evaluation of the DMIE program as a whole found no significant differences between the percent of T group participants and C group participants not employed by the end of the study period (which was either 12 or 24 months, depending on the state). The combination of Minnesota and Texas participants saw an insignificant increase in employment of 0.2%. The authors note that the only states to show statistically significant reductions in dependence on SSA benefits focused their interventions on a population with behavioral health problems. RCT The study examined in-company training program for employees of 17 organizations with the goal of enhancing career-management, mental health, and job retention (N=369). Printed information about career and health-related issues (N=349) Participants were employees at medium-sized and large-sized organizations. Mean age was 50.1 years, 88% were female, and most had a degree beyond high school (60%). At the 7-month follow-up period, the intervention group displayed significantly decreased depressive symptoms and intentions to retire compared with the C group. OS This was a 3-year longitudinal observational study of 286 patients with DSM-IV major depressive disorder and/or dysthymia The comparison group included 93 individuals with rheumatoid arthritis, and 193 depression-free healthy control subjects. At baseline, 25% of the depression group met the screening criteria for dysthymia and 75% met criteria for major depressive disorder and double depression. Mean number of symptoms was 2.9 for the dysthymia group, 4.8 for major depressive disorder, and 4.6 for double depression. Employees undergoing treatment for depression had worse job-performance scores than healthy employees even after demonstrating clinical improvements in symptom severity. Specifically, the study identified persistent deficits in performance of mental-interpersonal tasks, time management, output, and physical tasks. The study concludes that, although clinical interventions improve mental health, additional workplace interventions may be required to improve the performance of depressed employees. OS This was a retrospective observational cohort study of 2,112 employees with a new episode of treatment with an antidepressant medication. 1,301 employees adhered to acute-phase treatment, and 966 remained adherent to continuation-phase treatment. The population was 76% female and 87% Caucasian; 1.8% of all employees had a short-term disability event due to depression/ anxiety in pre-index period. Adherent employees were significantly less likely to have any short-term disability absence (8.8%) compared with non-adherent employees (12.7%). In the continuation-phase, 966 employees were adherent and 1,146 were non-adherent. Adherent employees were less likely to have any short-term disability absence than non-adherent employees (8.4% compared with 12%). Adherent employees were also less likely to have multiple short-term disability absences (0.9%) than non-adherent employees (2.1%). OS This was a retrospective observational cohort study of 1,281 employees at 3 major Canadian financial and insurance companies. The study examined adherence to treatment protocol. Included employees had depression-related absences from work, used their prescription drug benefit during the study period, and did not have more than 1 short-term disability episode 1 year prior to baseline. The study population was overwhelmingly female (88%), had a mean of 4.1 depression symptoms, and 46.5% had additional mental health conditions besides depression. Employees who returned to work FT or PT reported significantly fewer symptoms than those who left employment or went on long-term disability benefits. Employees who went on long-term disability benefits were significantly less likely to fill any antidepressant prescriptions during a short-term episode (27.7%) than those who returned to work (47.3%) or those who left work and did not go onto long-term disability benefits (42.7%). An ordinary least squares regression model found that EI was significantly associated with a reduced length of disability episode (β=-24.1 days). OS As part of the EIDP program, people were randomly assigned to 1 of 2 employment-intervention programs deemed experimental condition or to a services-as-usual control condition. This study of reasonable accommodations followed 1,654 people in both intervention and C groups. There were 370 participants reporting receiving at least 1 accommodation at work, and 1,284 reporting no accommodations. Of the accommodations cohort, 49.2% reported only 1 accommodation. Those without accommodations were on average older (by 2 years), had a higher estimated wage (62 cents), and had a higher proportion of individuals experiencing economic burden at baseline. Participants with job accommodations worked an average of 7.68 hours more per month than those without accommodations. Participants with accommodations tended to work for longer periods of time, with each accommodation decreasing the risk of job loss by 12.7%. Average job tenure for individuals in the no-accommodations group was 157.47 days; the accommodations group averaged 206.96 days. Participants in the no-accommodations group were much more likely to have a diagnosis of schizophrenia and to report symptoms of social withdrawal and social avoidance, and they earned 5% more. The latter finding may be due to discrimination against employees who disclosed a mental illness diagnosis. Participants who reported disclosure had a larger probability of reporting accommodations. A literature review included in the study located no high quality RCTs or well-controlled quasi-experimental studies measuring outcomes for reasonable accommodations for individuals with mental disabilities in the literature. T=treatment (group); C=control (group); FT=full-time; PT=part-time. QED Comprehensive EI services with occupational therapist (SE mentioned) ("EI" N=102) Generic CMHS ("no-EI" N=82); and generic mental health coupled with an SE worker ("partial EI" N=69). No vocational support mentioned. Avg. ages: 22, 23, 25, for "EI," "No-EI," and "Partial EI"
Differences by diagnostic group (schizophrenia, schizoaffective disorder, affective disorder, other psychosis) were not statistically significant. NOTES: Underlined studies indicate that the study reported statistically significant intervention-comparison differences for one or more outcomes. FT=full-time; PT=part-time; OR=odds ratio; CI=confidence interval. RCT Guideposts for Success-based, with SSA waivers (YTD) (N=400) Standard SSA rules and community services (N=383) High School juniors or seniors with SMI or SED 1 of the 6 sites had a significant, positive impact of 9 percentage points on whether the youth had held a job; 2 had significant impacts on whether the youth had held a job (19 and 9 percentage points, respectively) and on total earnings (a difference of $524 and $306 in annual earnings, respectively). The mental health focused project had no significant impacts on these outcomes. NOTES: Unless otherwise indicated, statistical significance was not reported. Underlined studies indicate that the study reported statistically significant intervention-comparison differences for one or more outcomes. FT=full time, PT=part-time, n.s.=difference is not significant. LR The review examined studies of social enterprises focused on individuals with psychiatric disabilities. 41 studies were reviewed for design and mental health outcomes; 1 study used a rigorous design and examined the effects of social enterprise employment on mental health. Some studies included individuals with disabilities, not necessarily psychiatric; some examined SE more generally. The 1 study identified by the authors (McKeown et al. 1992) suggested that working at a social enterprise improved mental health outcomes. QED The study examined employees of social enterprises in Quebec. Outcomes were collected for 67 individuals and compared with those from other studies of competitive employment. Employees of social enterprises had longer job tenure (86.9% of employees of social firms were still employed 6 months later, and the average job tenure of those at the firms was 6 years and 6 months, compared with average job tenure of less than a year) and worked more hours per week (30.7 compared with 15) than other studies have found among individuals with psychiatric disorders. QED The study compared individuals whose VR case was closed due to self-employment with others whose cases were closed due to employment (3,246 vs. 195,805). The sample was composed of individuals with disabilities, not necessarily psychiatric, whose VR cases were closed due to employment. Individuals with cases closed in self-employment had higher earnings than those with cases closed for other employment. LR The review examined 26 studies of consumer-run and consumer-led services. Review was conducted in New Zealand but some studies were conducted in the USA The authors conclude that the literature agrees that consumer-run and consumer-led services are at least as effective as similar services delivered in traditional ways, and may be more effective. RCT The study examined the effects of participation in consumer-operated service programs on empowerment. Individuals were randomized into T (920) and C (907) groups. The T group was offered consumer-operated service programs in addition to traditional services; the C group received only traditional services. Participants in the consumer-operated service programs experienced larger gains in empowerment than the C group. An intent to treat analysis also showed small positive effects. LR The review found 14 studies of consumer-operated services, consumer partnership services, and consumers as employees, 8 of which (representing 6 programs) used rigorous designs. The 2 rigorous studies of a consumer-run service program found that services provided by consumers were of the same quality as those provided by non-consumers. Participants in a self-help program focused on employment experienced gains in the likelihood of being employed and progress toward employment among those not employed, as well as higher earnings among those who were employed. RCT The study examined the effects of case management teams that include a consumer. 142 individuals were randomly assigned to case management teams with or without a consumer member. The 2 groups were found to be equivalent on all outcomes, including retention in the program, acute care use, adherence to medication, service use, substance abuse, and housing stability. Pre-Post The study focused on 77 individuals in a peer-support specialist training program. Pre-data and post-data were collected on self-efficacy, attitudes about recovery, and empowerment for the 66 participants who completed training. Study participants were volunteers enrolled in the program. 86% of study participants completed training, 80% of those were employed directly by the training agency, and 89% of them were still employed 12 months later. Among those who completed training, there were significant gains in self-efficacy, attitudes, and empowerment. QED The study examined the effects of Cash and Counseling on non-elderly participants with mental illness. 109 program participants were compared with a matched sample of 119 individuals who did not participate. Controlling for background characteristics, the authors found that the T group was more satisfied with services, and the 2 groups were similarly likely to experience adverse health outcomes. Pre-Post The study examined outcomes for individuals participating in a self-directed care program. Data was collected on 106 program participants in the year before enrollment and the year after. Participants spent more days in the community and had higher functioning in the year after enrollment. There was no evidence of overspending. LR/ Case Study The report examined 8 IDA programs targeted toward individuals with psychiatric disabilities, and reviewed literature on IDA programs. Many of the individuals using the IDA programs were able to successfully build savings to meet their goals. For those who were not successful, the barriers were not directly related to their having a psychiatric disability. No rigorous studies were found of the effectiveness of IDAs for individuals with disabilities. One study suggested that participants with disabilities had lower average monthly net deposits than those without. LR The review found 8 studies of supported education, 2 of them of high quality. Participants in supported education programs were more likely to enroll in post-secondary education. Pre-post studies found improved employment outcomes and decreased hospitalizations. One RCT found improved quality of life and self-confidence, and fewer social problems among participants. RCT The study examined the effects of enrollment in a supported education program. 69 individuals were randomly assigned to participate in supported education, or to be referred to VR services. The study sample was mostly in their 20s and had recently experienced the onset of schizophrenia. After 18 months, participants were about as likely to be enrolled in school, employed, or both. RCT This study reported outcomes for the investigation described in Neuchterlein et al. 2008. 83% of participants returned to school or work within 6 months, compared with 41% of the C group; 92% of the T group was in education or employment for at least part of the following year. The T group also had longer time in school or a job. RCT Workplace "stay at work" and RTW interventions--defined by changes to the workplace or equipment, changes in work design and organization, changes in working conditions or environment, and occupational (case) management with active stakeholder involvement of (at least) the worker and employer--compared to "usual care" (no intervention) and clinical interventions Employer Working-age adults (ages 18-65) on work disability with LBP, upper extremity disorders, or musculoskeletal disorders at risk of leaving work because of sickness The authors synthesized 6 RCTs. There is moderate quality evidence to support the use of workplace interventions to reduce sickness absence among the subgroup of workers with musculoskeletal disorders when compared to usual care. No convincing conclusions could be formulated about the effectiveness of workplace interventions on other work-related outcomes, regardless of work disability type. Considering all types of work disability together, the results showed low quality evidence that workplace interventions are more effective than usual care in reducing absence from work because of sickness. RCT WPDM programs promoting RTW Employer Workforce re-entering employees with injuries or illnesses (occupational or non-occupational) There was a lack of evidence to draw conclusions about the effectiveness of employer-provided WPDM programs; thus, the review could not determine whether specific program components or specific sets of components are driving effectiveness. Longitudinal and controlled Interventions involving the workplace vs. those that do not; RTW Employer People, particularly those suffering from back pain and related musculoskeletal conditions, currently employed but at risk of job loss due to disability Interventions involving employees, health practitioners, and employers in collaboration are more consistently effective than other interventions. EI was found to be effective. An economic evaluation indicates that interventions with a workplace component are likely to be more cost-effective than those without. Cost accounting SE, broadly speaking Employer/ community Disabled persons who participate in SE programs vs. disabled persons who work in segregated settings/ workshops Individuals with disabilities experience greater monetary benefits than costs when working in the community under conditions of SE. Cost efficiency appears to hold, regardless of type of disability and the presence of secondary conditions. Recent research strongly suggests that SE returns approximately $1.46 per dollar of taxpayers' cost. Literature suggests that SE is more cost-effective than sheltered workshops. This is the case whether cumulative costs, cost per hours worked, dollar earned, or months of service are compared. RCT, and QED and cohort design Workplace-based RTW interventions and health care provider interventions Employer Working individuals with musculoskeletal disability or other pain-related condition, at risk of job loss Workplace-based RTW interventions can reduce work disability duration and associated costs. Researchers found strong evidence that work disability duration is significantly reduced by work accommodation offers and contact between health care provider and workplace, as well as moderate evidence that it is reduced by interventions that include early contact with the worker by workplace, ergonomic worksite visits, and the presence of an RTW coordinator. For these 5 intervention components, there is moderate evidence that they reduce costs associated with work disability duration. Evidence for sustainability of these effects is limited. QED; authors also reviewed qualitative studies Competitive/ supported/ integrated employment assistance interventions, including job finding, work preparation, communication with employers, and job coaching Employment-support workers; adult service program agencies Unemployed adults 18 and older with ASD, not enrolled in a school-to-work or secondary-level education program, voluntarily trying to secure employment A review of two QED studies was unable to identify definitive interventions that predictably and positively support the development of employment outcomes for individuals with ASD. Qualitative work suggested the following elements as promoting employment placement among people with ASD: identification of the most appropriate work settings and placements; provision of effective supports on-the-job; long-term support services for the employer and consumer; costs for support; positive effects of employment on persons with ASD. Qualitative studies could not, however, provide definitive statements about what works. Prospective; cross-sectional Workplace rehabilitation interventions, including early RTW/ modified work interventions, ergonomics, and supervisor involvement Employers and health care providers Injured workers with musculoskeletal work-related LBP, trying to return to and/or at risk of leaving work Evidence that clinical interventions combined with occupational interventions as well as early RTW/modified work interventions were effective in returning workers to work faster. Early RTW/modified work was effective in decreasing the rates of back injuries as well as lost-time back injuries, especially when accompanied by early contact with the worker by the workplace, and a health care provider intervention at the workplace. Ergonomic interventions--including exercises, lumbar supports, participatory ergonomics, and workplace adaptation--were also found effective in returning injured workers to work. Economic analyses, the majority of which included a cost-benefit/cost-consequence analysis; analyses ranged in design from RCTs to uncontrolled experiments to pre-post 17 DM interventions, including vocational and ergonomic interventions, standard care, behavior-oriented physiotherapy, and recovery/case management Mix of employer financed and non-employer financed Various disabilities The review found strong evidence supporting the economic merits of DM interventions conducted in multiple industries. There is moderate evidence for interventions that include an education component, moderate evidence for those with physiotherapy, limited evidence for those with a behavioral component, and moderate evidence for those with a work/VR component. There is moderate evidence for interventions including a work accommodation offer, contact between the health care provider and workplace, early contact with the worker by workplace, ergonomic worksite visits, and interventions with an RTW coordinator. QED, cohort studies, case series, and cross-sectional study VR and interventions; on-the-job supports; community work and SE programs Employers/ the community Young adults ASDs Little evidence is available for specific vocational treatment approaches as members of the population transition into adulthood. The majority of studies included, of which there were a limited number, suggest that vocational programs may increase employment success for some. RCT and non-RCT studies with comparison groups VR vs. alternative programs or care as usual on return to work Employer Individuals with MS attempting to return to work There is insufficient evidence for VR programs for: (a) "competitive employment" in altering rates of job retention, changes in employment, improvement in rates of re-entry into the labor force; and (b) altering "work ability" by improving participants' confidence in the accommodation request process or employability maturity or job-seeking activity. There is no evidence for changes in proportions of persons in SE or on disability pensions, or for cost-effectiveness. Inconclusive evidence to support VR for MS.
Quantitative (RCT, QED, and small- scale studies) and qualitative research designs Various health, work, and social interventions designed to help people with common health conditions stay in work or return to work, including workplace-based CBT, workplace-based patient education, VR, and encouragement of physical activity Employer People with common health conditions, either out of work or possibly at risk of job loss The evidence base for work-related interventions for people with common health conditions has not changed substantially since 2007, and studies generally lack robust quantification of employment outcomes and cost/benefit analysis of interventions. Little quantitative evidence is available for interventions carried out in the UK. Areas in which there is a reasonably strong body of evidence, with positive effects, include the following: workplace-based interventions for those with musculoskeletal disorders, particularly for LBP; CBT, VR and workplace rehabilitation for LBP; SE for people with severe mental health conditions; and psychological interventions for depression. Some evidence of the benefits gained from coordination between rehabilitation professionals and the value of a case management approach among studies examining interventions for people with general health conditions. The majority of studies on musculoskeletal conditions focus on LBP, with some evidence that a multidisciplinary approach, including CBT and workplace-focused interventions, are effective in terms of benefits and costs. Evidence on other interventions is either of low quantity, poor quality, or inconclusive. RCT and QED Government initiatives involving work supports, One-Stop Centers, job training, case management, work incentives, work incentives counseling, and expanded options for ENs or rehabilitation services. Authors also examined legislation, policies, and tax incentive-based initiatives Government SSI/SSDI beneficiaries with various disabilities; individuals with severe/significant disabilities, including those with limited or no work experience Among the findings reported, the most germane to this report include the following: TTW, a program for persons receiving SSDI, provided employment-support options and opportunities for participants. Enrollees could select a range of public or private EN services, including state-federal VR. TTW provided greater consumer choice than previous programs. Evaluations of TTW indicate the impact on earnings was too small to evaluate compared to historical trends. Based on evaluation report findings, each report author suggests similar components needed for an intervention to produce an impact on employment. RCT and QED Government demonstrations involving work supports, case management, job training, work incentives counseling, and expanded options for ENs or rehabilitation services Government SSI/SSDI beneficiaries with various disabilities Among the findings reported, the most germane to this report are from the 1980s and include the following: The STETS T group had an employment rate 63% higher and earnings 74% higher than the C group. 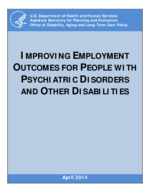 TETD, an employment-support program for individuals with intellectual disabilities, also reported a significant impact on employment rates and benefit amounts. After 6 years of enrollment, persons in the T group had earnings 56% greater than those not receiving the services. RCT RTW coordination involving direct assessment and individually tailored RTW, compared to usual practice in patients at risk for long-term disabilities. Private disability insurance Employees on sick absence for at least 4 weeks; primarily consisting of workers with musculoskeletal disorders and LBP Overall, there was moderate evidence to suggest the benefit of RTW coordination on reduction in sick leave and returning to work. Authors note that publication bias could limit the results. Observational studies Interventions involving case management, personal advisors, job-search assistance, and financial incentives Government Individuals with disabilities who were not employed and on some form of incapacity-related benefit. RTW interventions with components such as personal advisors and individual case management helped participants return to work. However, the review consisted primarily of observational studies. No RCTs were included in the review and there was evidence of selection bias in some of the programs; hence, there is limited evidence of effectiveness.